The world is filled with 1000's of careers. Open your child's eyes to the wonderful world of careers. Discover your child's career interests. Learn about how careers are broken up into six career groups. Discover careers in our world. 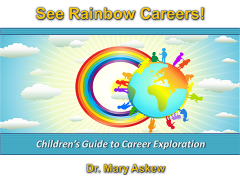 Click on See Rainbow Careers graphic to view demo. Destiny Discovers Purpose is a fun way to introduce middle school students to careers. Career interest areas are like gems. Discover your child's destiny and purpose. Learn about how careers are broken up into six interest areas. Click on Destiny Discovers Purpose graphic to view demo. Please share information about Destiny Discovers Purpose demo. Get more information about app demos .